Still aglow from my Valentine’s Day, I jetted off that weekend to visit my cousin and her new baby in San Francisco. Though we’re all rooted on the East Coast, three of my closest cousins somehow landed in California. It seemed I was the only one in the midwest.. How they all got there was a mystery, but it was easy to see how they could be seduced by the mid-February sunshine. The moisture was sucked out of me during the flight and I was in the air just long enough to develop an overwhelming appetite. Fortunately, I arrived at dinner time. Unfortunately, cousin Jeb had committed to bringing us burritos from El Farolito, and, with Jeb being the perpetually slow person that he was, I knew it would be hours before we’d get to eat. To tie us over until Jeb’s arrival, cousin Laura and I snacked on a box of chocolates. Laura had more self-control than I did. She was breastfeeding and only ate three pieces. I ate more than half of the box and I was still overly eager for my burrito. It didn’t arrive for another hour — an hour and a half later than Jeb was slated to get there. At the table, we were joined by Jeb’s girlfriend, Theresa. Laura’s husband arrived during dinner, but stole away to the baby’s bedroom to rock him to sleep as soon as he got there. Being with my cousins was always an occasion to drink — it’s how we interacted — so I joined Jeb and Theresa in a glass of wine, despite the promise I made to myself not to drink. When I get back to Chicago I’ll stop, I thought. This was surprising to me. I knew Jeb liked to imbibe, but the only time I’d ever noticed him incoherent was once when I visited him in college, but that was only because he’d smoked a lot of weed. He never seemed out of control to me. “I think it’s definitely something that plagues our family,” he said this with some jocularity and no conflict about whether or not to quit drinking. “It’s hard to be interesting and charming,” said Laura. Laura went to bed and I continued drinking with Jeb and Theresa. Fortunately, I didn’t get out of hand that night. In the morning, Laura and I got up early to take a walk around around the neighborhood with baby Teddy. I loved and hated San Francisco. Love: on any given corner there’s lavender to the left and rosemary to the right, and spring was a welcome arrival in February. Hate: the cost of living was insurmountable and spring was unwelcome by July. At that moment in February with 65F temperatures while Chicago topped out at 25F, I was in love with San Francisco. On our stroll we stopped at a bake shop on Arguello called Arsicault. 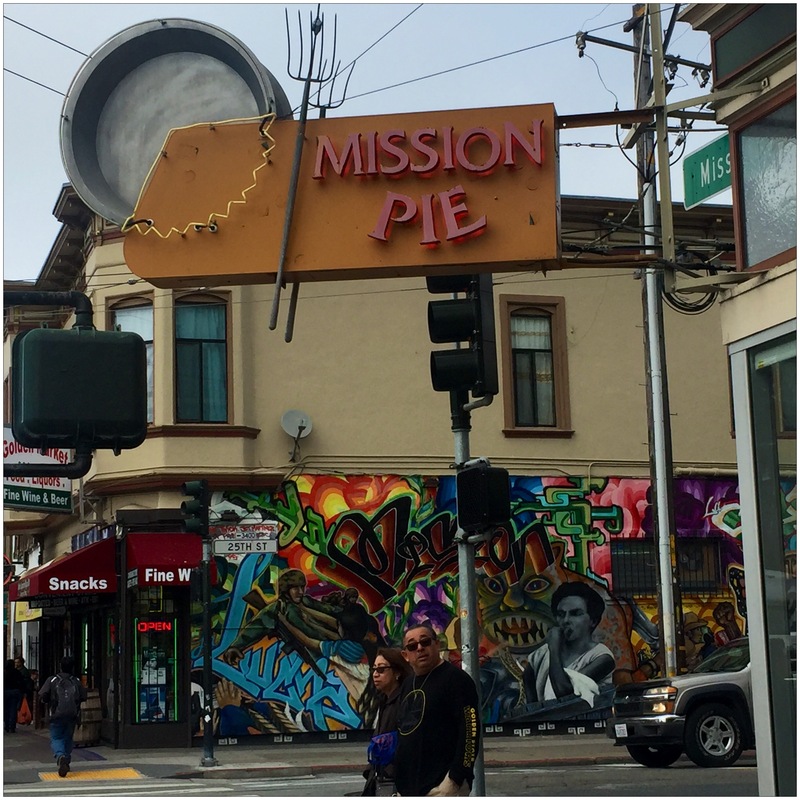 This place wasn’t quite my style — I felt more at ease at Mission Pie — but it was pretty awesome. Everything was clean and neat with baked goods being produced en masse just three yards from the cash register. I ordered a coffee with a citrus brioche and Laura had a decaf with a chocolate-almond croissant. 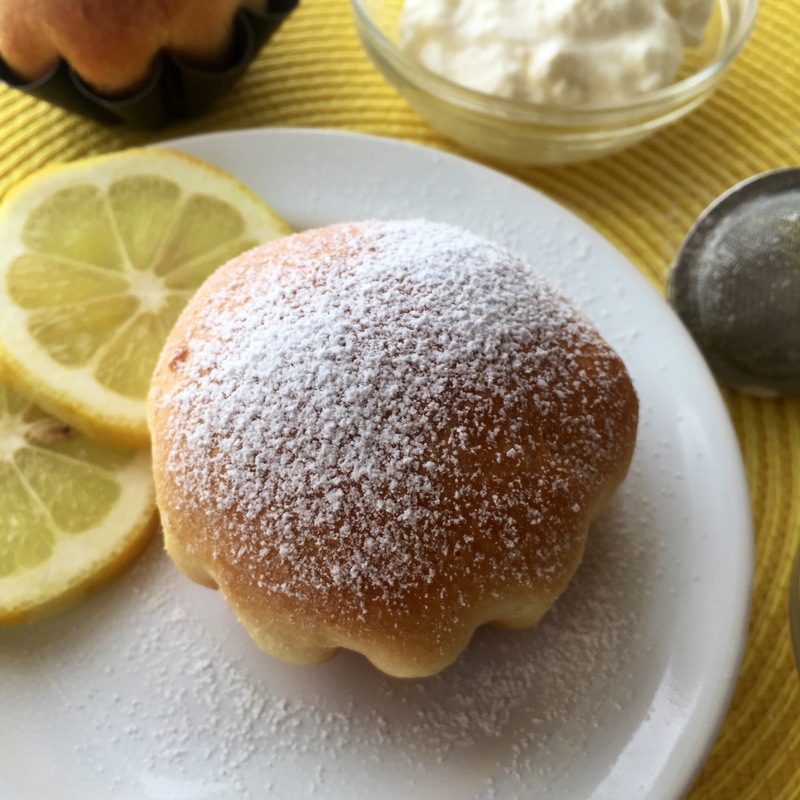 I loved enriched doughs — cinnamon rolls, sticky buns, brioche — and this brioche was superlative. It was glossy with a sweet citrus glaze; moist, buttery and yeasty. I could have eaten ten more of those. 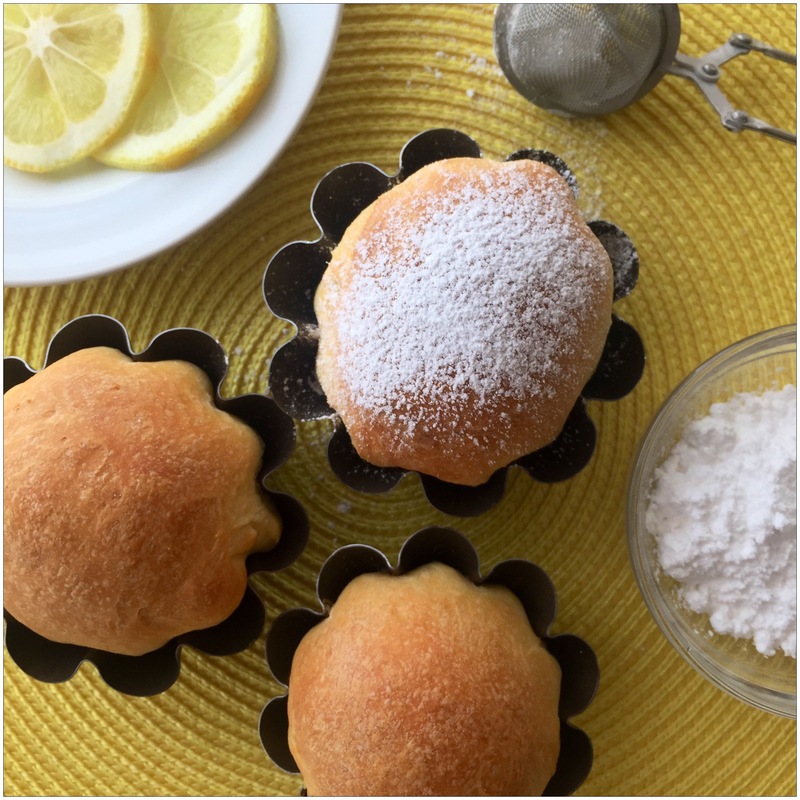 The experience made me long to work in a bakery and stick my hands in that silky dough every day. What I needed to do was order that Bouchon Bakery cookbook or drive the fifty miles north to get the book accompanied by a sweet snack at the book’s namesake. When I get back to Chicago, I thought, I’ll order the book and work my way through it. Later in the day, we got lunch at the first place we saw with food in Hayes Valley. Jeb met us there and Laura convinced Mike it would be a fun family event. It was loud and crowded but not so crowded that we couldn’t enjoy family time. I loved my cousins. I don’t remember what I ate — probably some greasy version of eggs benedict with a slick form of hash browns. But I do remember that I had two bloody marys and Jeb didn’t let me drink alone then or for the rest of the day. Mike, Laura and Teddy split after we had a scoop at Smitten Ice Cream. There’s no shortage of sweet treats in San Francisco, and this place was a very ambitiously sweet shop. They made each scoop individually as it was ordered. To do this, they had specially made machines chilled with liquid nitrogen that could make ice cream in one minute. I had Earl Grey. It was pretty amazing. It tasted just like tea. Always accommodating, Jeb took me on a walking/drinking tour that led us to the bookstore I requested to go to. We walked from Hayes Valley south.. stopping first at a friend’s house, but no one was home. Moving along on Valencia Street, we found people enjoying the sunny afternoon with suds in the beer garden of Zeitgeist. Jeb was so popular, he was stopped by someone saying hi every few steps as our buzz started to fade. Everyone seemed a bit old (my age) to be enjoying so much beer so early in the day. But I was not judging. We sat at a picnic table with one of his buddies who’d clearly done a lot of world-traveling and no shaving in the last forty years or so. As we drained our first pitcher of beer, I spotted a familiar face. I recognized it, but it wasn’t a face I actually knew. It was a face I knew twenty years ago with new creases and additional layers of flesh. I couldn’t think of her name or what to say to her, but I knew I had to talk to her. “Brooks. Oh my God,” Carly said. That was about as interesting as the conversation got. She and I had gone to elementary school together and remained in the same social circle without really being friends through college. She dated one of my close friends in Chicago, Ryan, for a little while. Carly was seated, plumply, with a group of people — one of which was her husband that I didn’t manage to notice even when he was introduced to me. She was wearing boring jeans, sneakers and one of those hideous North Face fleeces that too many women adopt as casual wear. She looked terrible. 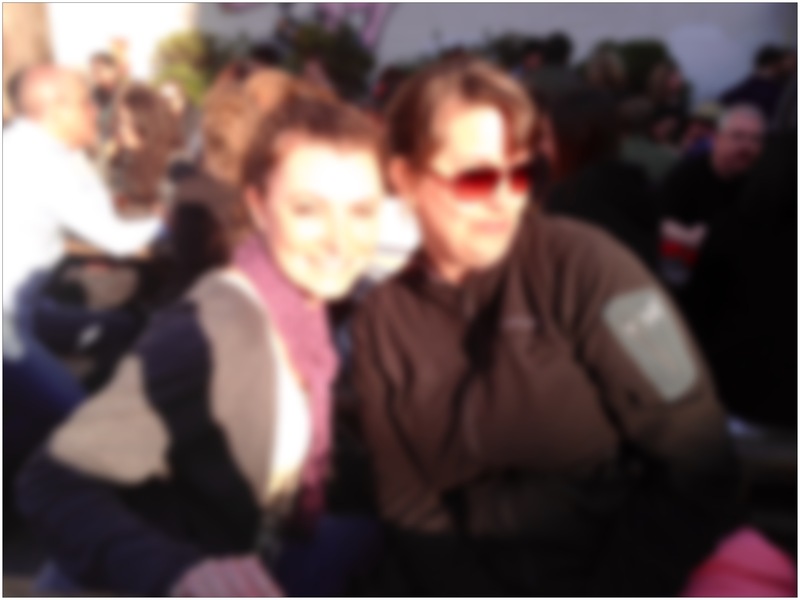 I couldn’t resist taking a picture of us together — two women from Colorado drawn together by beer in San Francisco — to send to Ryan. I left as quickly as could have been polite after making plans that would never happen and not exchanging telephone numbers. It was just an interesting detour, but of all the people that I could have run into, she wasn’t one I wanted to see. At least I wasn’t shitfaced when she saw me; it could have been embarrassing. As the sun started to disappear, Jeb and I made our way to the door and down Valencia to Beretta for craft cocktails. I had a lavender Collins and Jeb had a Manhattan. It was too crowded to find a seat so we stood at the bar as long as we could stand it and moved on to the bookstore. It was getting too chilly to be wearing only a cardigan. Of course. This is the chill San Francisco is famous for. Hot during the day, but as soon as the sun goes down, a change of wardrobe is required. I had to stop at a street vendor to buy a hoodie with the San Francisco skyline drawn on it. Jeb was an artist and he approved of the purchase. I was pleased and 1,000% warmer. 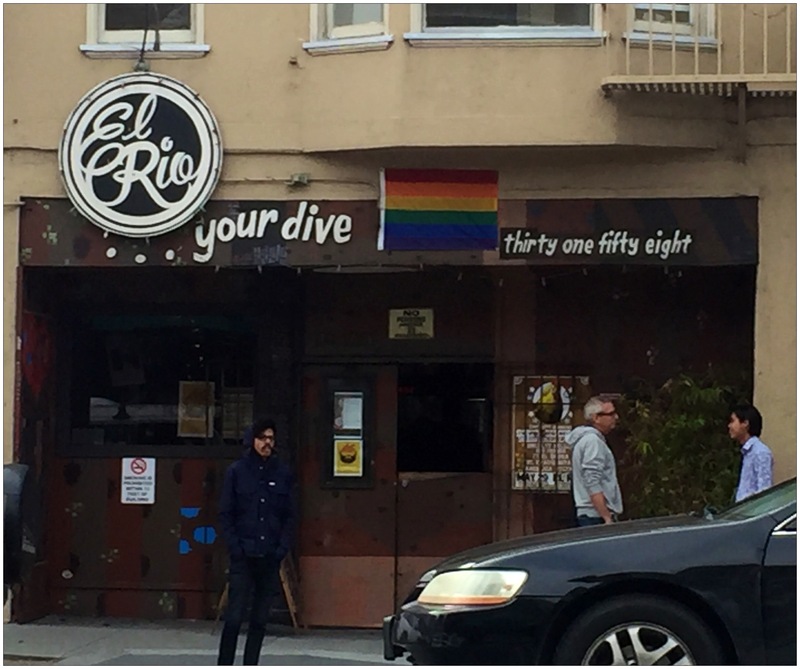 Our last stop before dinner was El Rio. We drank beer and sat under heat lamps on the patio so we could smoke cigarettes. A lot of them. We were in a space that easily could have fit six people so a woman asked if she could sit with us while she waited for her boyfriend. She was from Modesto but moved to Milwaukee on a whim and worked retail. She met a carpenter there that she fell in love with, but she hated the Badger State so she dragged him to San Francisco. She was a colorful girl who overshared… and just when we thought she was done sharing, she pulled out a bag of weed. I rarely smoked pot, but marking this as my last weekend of debauchery, I decided to participate. I wasn’t drunk before I smoked, but I was definitely not sober by the time her boyfriend arrived. And when he arrived, I decided we should leave. I had to eat. We walked up Mission Street and stopped at Dante’s Weird Fish. I got the catfish po’boy. I was too high to figure out what Jeb was eating. I got the fries with veganaise because that was more appropriate for my state than clam chowder or salad. I enjoyed my po’boy, but I was in a fog both literally and figuratively and the only way to clear that cloud was to eat as quickly as possible and get back to Laura’s. Jeb put me in a cab and I directed the driver back up to Pacific Heights and sobriety forever. When I got back to Chicago, I packed up my last big bottle of Jameson and marched it over to Lena’s house. She accepted the donation with spirit and said, “Maybe if you’re cured by summer, we can make fun cocktails!” The difference between her relationship with alcohol and mine was that that bottle wouldn’t last a week at my house and she was capable of letting it sit on the shelf for four months. The following weekend Werner had a party at WeeGee’s for getting his kickstarter project funded. I wanted to go, but it was strictly a cocktail lounge and I didn’t yet trust myself to be around that much alcohol or, frankly, Noah. Instead, I offered to babysit Ford that night so both Lena and Bryan could go out. It was my first sober weekend and I, appropriately, was spending it with a three-year-old. I read about five books to Ford before he fell asleep. When he was totally out, I struggled with what to do. I worked on the scarf I was knitting. I read bits of two different books I wasn’t interested in. I watched TV shows that I normally wouldn’t watch. I was bored. I felt sad. I felt lonely. I felt left out. I felt sober. It was terrible. Filling the 36 waking hours I spent drinking and recovering every week with something productive was a tall order. I thought about the pie business. It frightened me so I decided to start small: I ordered the Bouchon Bakery Cookbook. 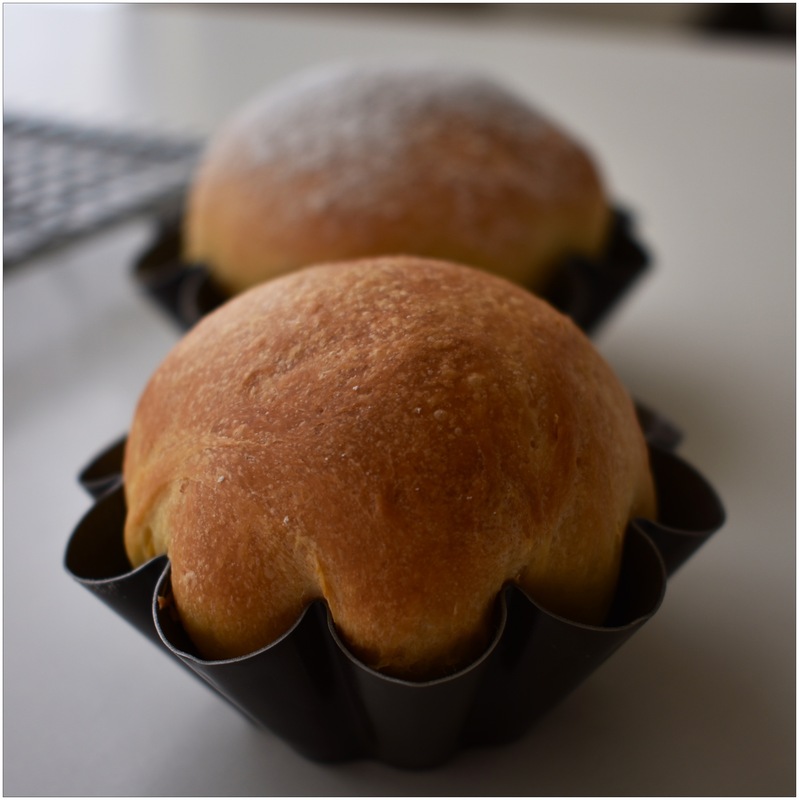 But I couldn’t wait for it to arrive and started with brioche from an old tome from culinary school. 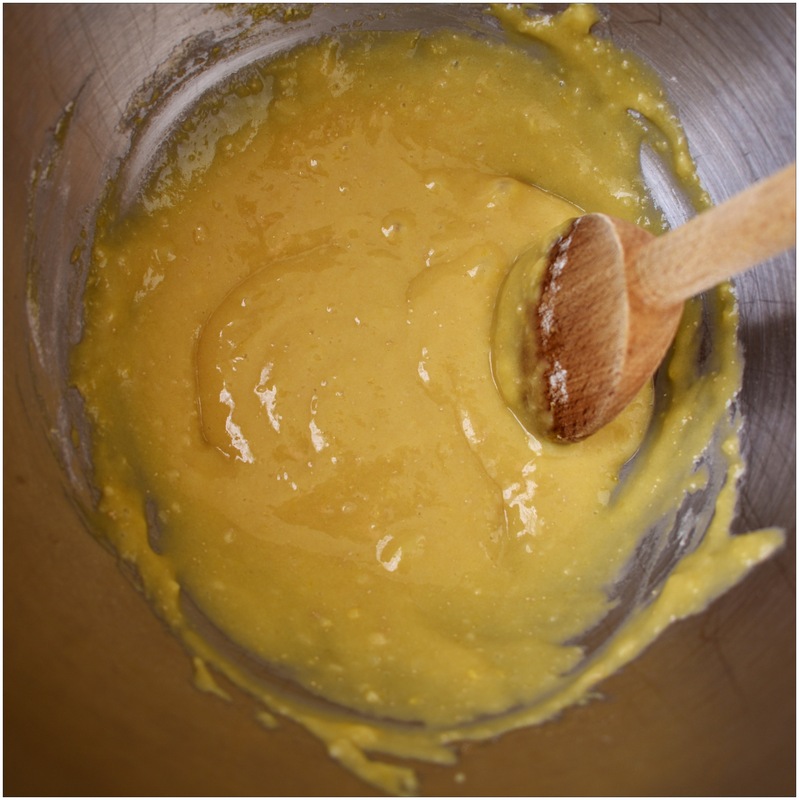 Sponge: In the bowl of a stand mixer fitted with the hook attachment, pour in the milk and sugar and sprinkle the yeast on top. Let it sit for about five minutes and it starts to get bubbly. 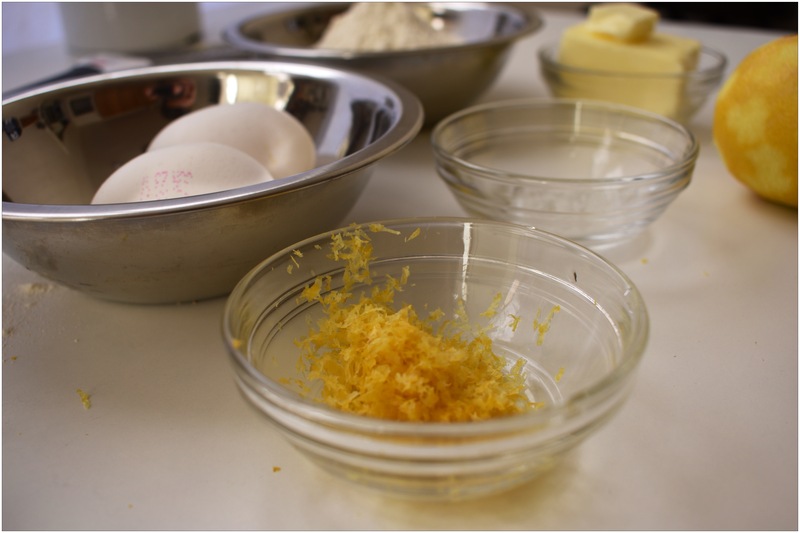 Add the egg yolk and half of the flour. Stir with a wooden spoon until it well-combined. 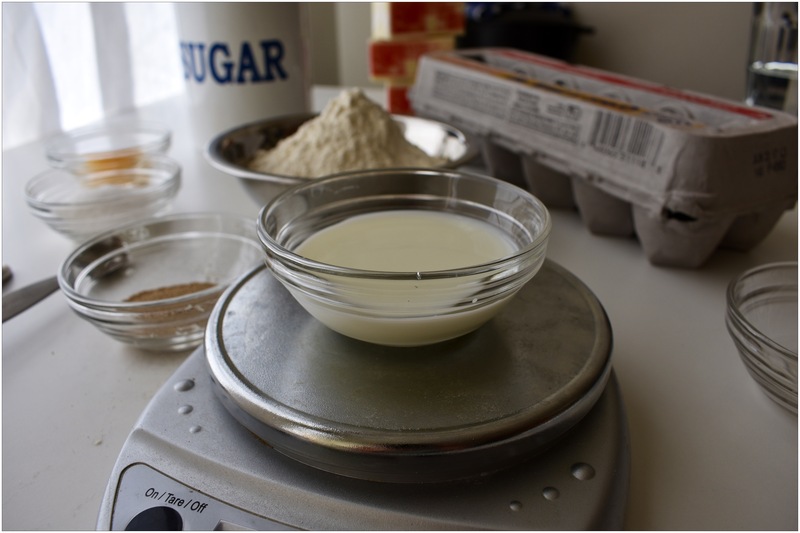 Sprinkle the remaining flour on top of the mixture. Set aside for 40 minutes, uncovered. Add the salt, eggs, and 4 TB of flour to the sponge. Mix on low for about two minutes. 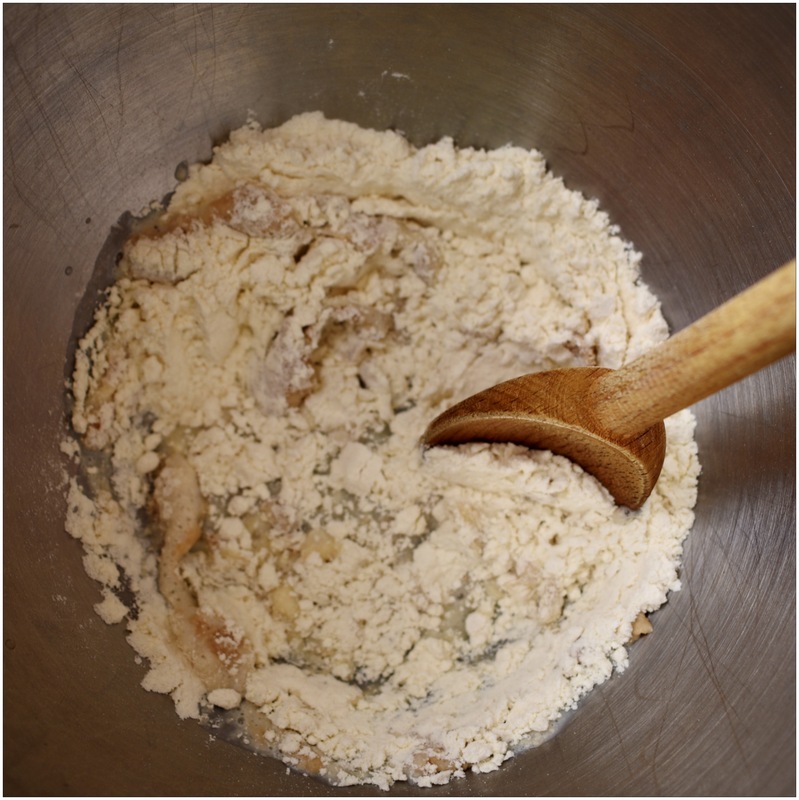 Add the remaining flour. Scrape down the sides of the bowl. 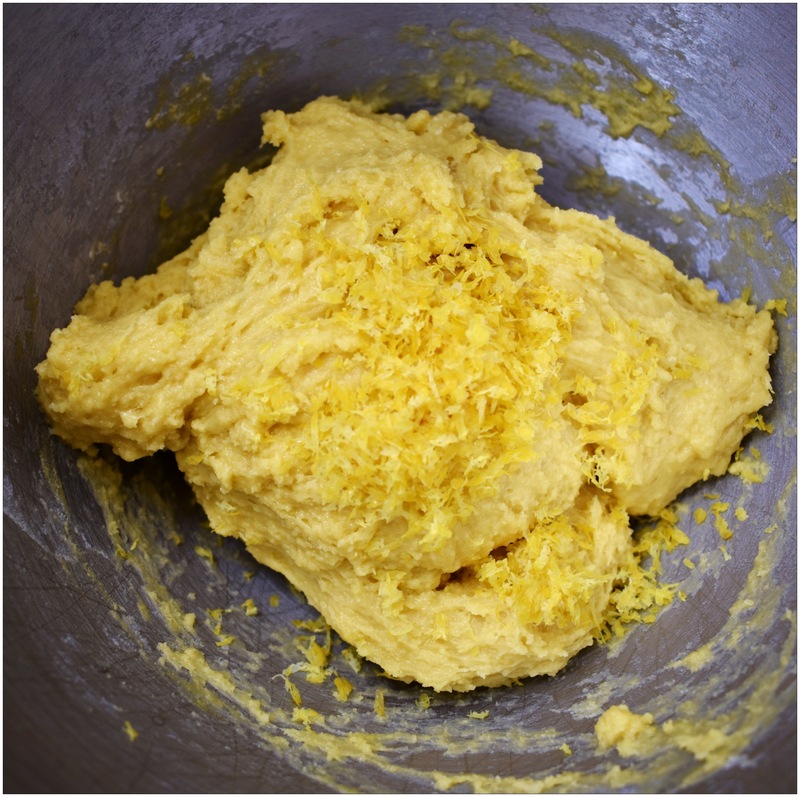 While the mixer is still running add the butter a little bit at a time until it’s all incorporated. Continue mixing for another five minutes. 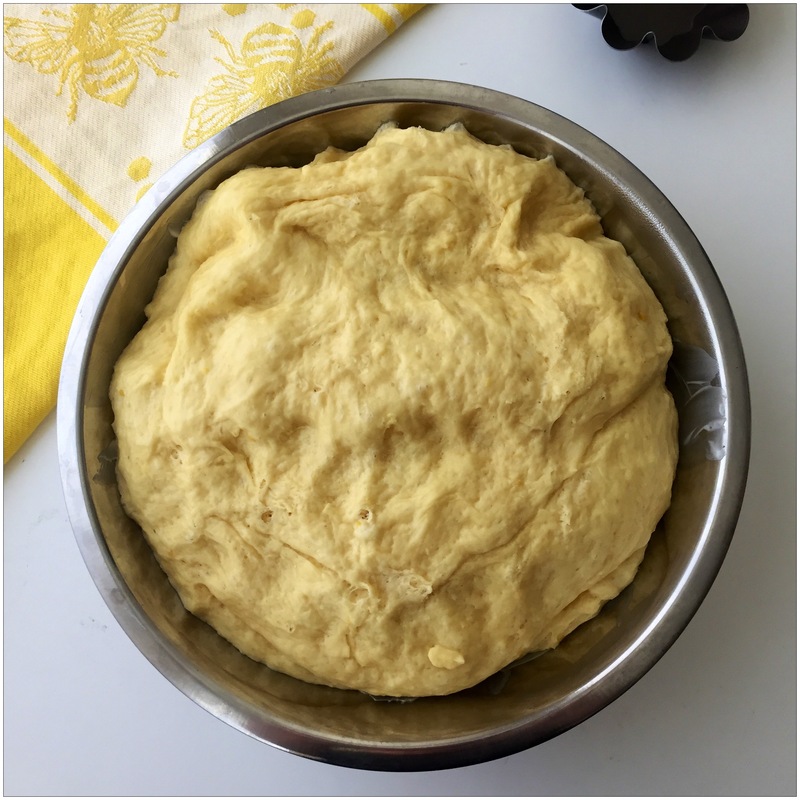 Transfer dough to a large buttered bowl, cover with plastic, and let it rise at room temperature until doubled in bulk, about two hours. Punch down the dough. Cover and and refrigerate overnight. It should double in size. 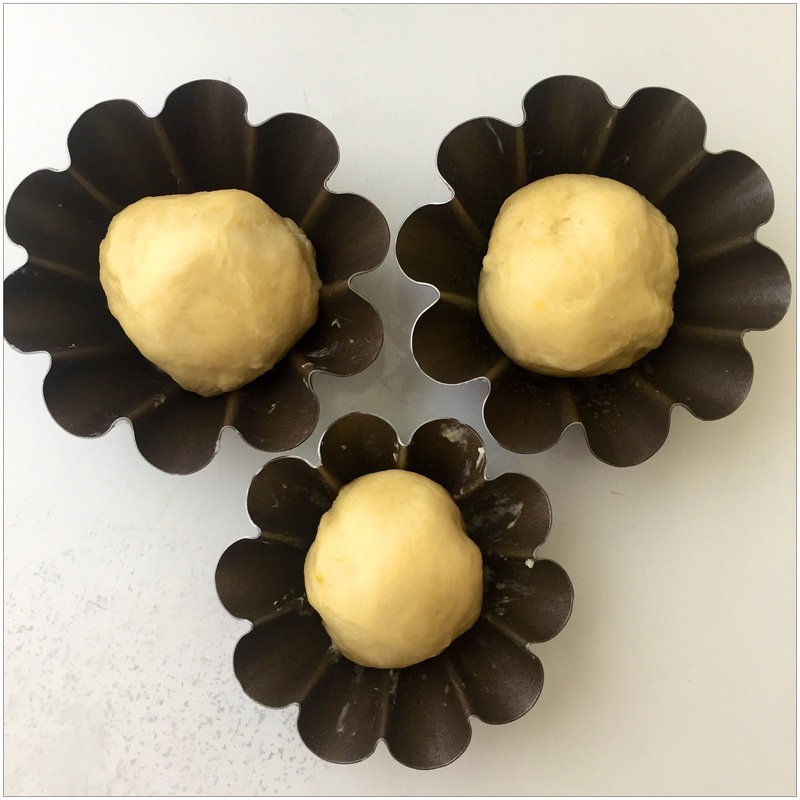 On a lightly floured surface, divide the dough into three pieces and form balls. PLACE IN A BUTTERED PAN COVER WITH PLASTIC AND LET RISE FOR TWO HOURS. 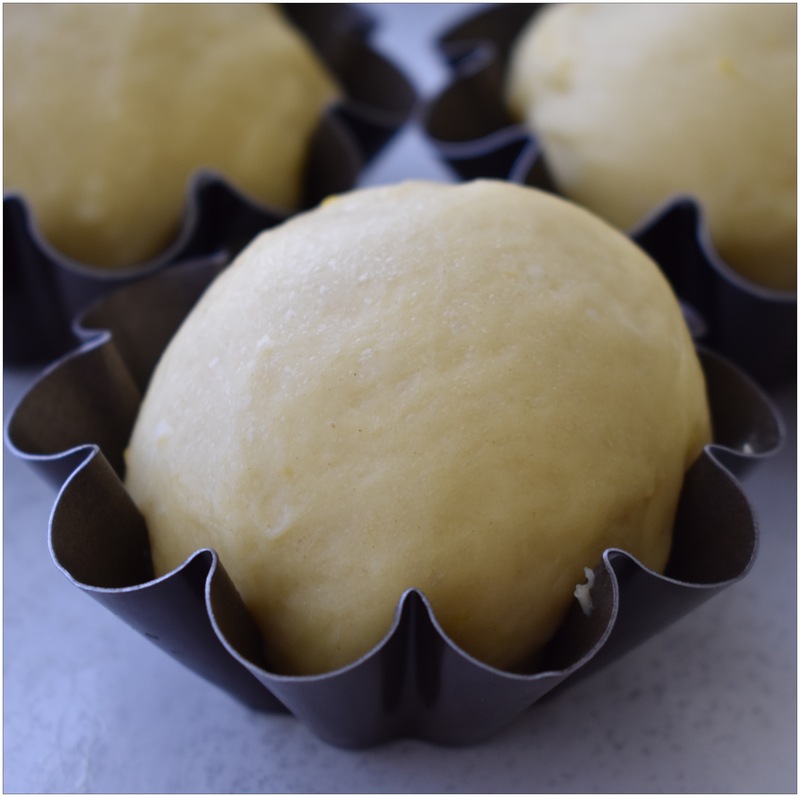 Bake for 30 minutes or until the internal temperature reaches 200°F.